Concentric rings typify the black square melamine piates you will find in the Ardesia Rika Melamine Dinnerware collection. 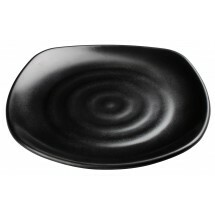 Available in many sizes, you can serve anything from salads to entrees to desserts on these uniquely designed plates. 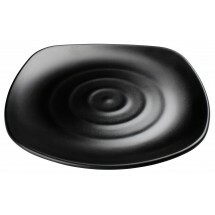 The larger plates can even be used as charger plates to be placed beneath other colors of dinnerware, or as serving plates for shared entrees. Constructed of melamine, these durable, sturdy plates are NSF listed and dishwasher safe. Thanks to their swirl design, they can be mixed and matched with many different Winco melamine bowls to create the perfect table setting.